It's time to sit back and enjoy some truly great guitar playing featuring two of our favourite pickers! Chico, Tim and various friends show what the guitar is all about on Friday November 3. The music starts at 6:30pm - so relax and enjoy some of Porters reasonably priced Friday night entrees featuring pasta and schnitzel selections. 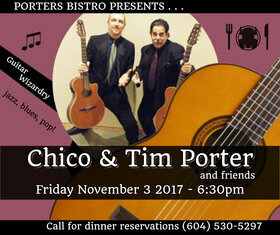 Fully licensed, call for reservations: (604) 530-5297.